Brittany Vollmer, a student at Northwestern College in Iowa, lost her parents, brother and sister in a car crash that occurred in South Dakota. According to a news report in the New York Daily News, the fatal accident occurred on February 23, 2012. Officials say Brittney’s 52-year-old father, James, was driving the family’s 2005 Ford Explorer SUV on Interstate 90 west of their home in Sioux Falls. He was with his wife, Julie, 48, daughter, Alyssa, 16, and son, Caleb, 13. Officials say the Explorer swerved off the highway suddenly struck a guardrail and rolled down an embankment. The force of the crash caused the SUV to split in half. James, Alyssa and Caleb died at the scene while Julie Vollmer was transported to a local hospital where she died later. South Dakota officials are trying to determine what caused the crash. All four vehicle occupants were buckled up and alcohol is not believed to have been a factor. What Caused This Rollover Accident? Based on this news report, it appears that the driver of the Ford Explorer, James Vollmer, lost control of the SUV, which caused it the rollover accident. There are still several unanswered questions here. What caused this tragic crash? Was there a vehicle defect or mechanical malfunction that may have caused or contributed to this incident? Did a design defect in the Explorer cause the occupants’ fatal injuries? Was the incident triggered by a medical issue? I trust officials are looking into these and other issues in order to determine precisely what occurred here and why. In such cases, if the crash was caused by a vehicle defect or design flaw, families of deceased victims can file a wrongful death lawsuit against the automaker. Such claims seek compensation for damages including medical expenses, funeral costs, lost future income, loss of inheritance and loss of love and companionship. SUVs, especially the Ford Explorer models, are notorious for rollover accidents because of their defective design. Their high center of gravity and narrower track width make them prone to rollovers. Occupants in such crashes are fatally or catastrophically injured. 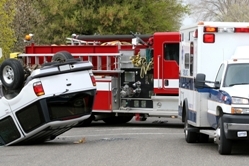 Victims or their families would be well advised to contact an experienced auto products liability lawyer who has successfully handled Ford Explorer rollover cases.